Atco B30 Royale - help! Dear All, I am about to collect my mower from a repair shop as the price for repair is beyond what I can bring myself to spend on it. So I have decided to take the mower on as a project and try to get it working myself. The mower dates back to the '80's, I believe. 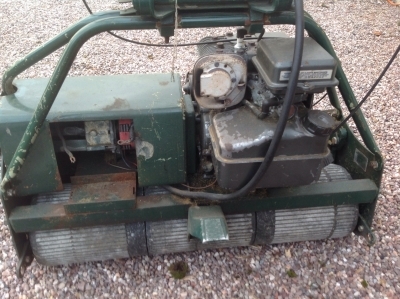 It is complete, but well used, with a Briggs & Stratton engine. The main issue is it's reluctance to reliably engage the cylinder drive. The repairer claims that wear to the end of the shaft on the cylinder is the culprit, with a new part priced in excess of £300. My thoughts are to get the mower back, dismantle it, see if I can get the most expensive part machined, and restore it to working condition. I am new to the club and will no doubt be asking for comments and advice as the project proceeds. I am reasonable familiar with old BMW motorbikes, but the peculiarities of mowers are something that I am about to be come accustomed with (with a little help from my friends!). I am unable to post pictures yet (as I have yet to collect it), but any thoughts/opinions/advice would be most welcome. I have about 1/2 an acre of lawn that would benefit from being rolled, whilst being cut, with this type of mower. I noticed on a previous post that Wristpin recommended a Webb 24 with belt drive as a weapon of choice. Comments as to it's suitability for my purpose would also be welcomed. The Atco is a beast to manouvre and it appears that the Webb's can be had for reasonable prices. Not sure about wear on the shaft until we see an image but the Atco 24/30 was prone to wear on the blade drive engagement dogs resulting from being run out of adjustment and perhaps heavy handed treatment. Something to be aware of is that during production of the 24/30 they switched from BSF threads to UNF threads with associated changes to the cylinder drive dogs etc. If your machine had a Briggs engine from new it will almost certainly be UNF but if it started life with a Tecumseh or even a Villiers it will probably be BSF. My preference for the original belt drive Webb 24 is purely a personal thing and not necessarily a recommendation! It was a softer machine to drive and was not any the worse for being belt drive so long as they were properly adjusted. It was amazing how many so called mower repairers appeared to be unaware of how to set them up. However one thing that is for sure is that parts for the belt driven Webb will be far more difficult to obtain. The Atco has the advantage of still being in production under the Allett umbrella as the Buckingham and as far as I am aware uses the same drive components. Ideally post some images of the offending parts with as much of an explanation of what you have been told as possible. If your repairer has reassembled the drive mechanism and you start to pull it apart be aware that the hexagonal sleeve on which the drive gears engage and slide is a splined push fit on the end of the cutting cylinder - the hexagon has been known to invite the application of a long handled spanner with the consequent twisting of the sleeve! If by any chance the splines on the cutting cylinder are worn to the extent that the sleeve is slipping it is time for a new cylinder of a visit to a well equipped and clued up machine shop: this may account for the size of the estimate. I will sort out a parts breakdown of the drive mechanism and add it to this post later. Here are two parts diagrams. One shows the BSF/UNF equivalents and the other is just "current" UNF - assuming that Alletts are not now building them to metric standards. Note that if you want to look up or Google the part numbers you will need to put F016 in front of the L number with no gap eg F016L20315 for the unf drive sleeve mentioned above. (0 is a zero not an alpha O ) ! Wow - what fantastic and detailed reply (given the sparse information provided). I collect the beast tomorrow, so will then be in a position to obtain engine/chassis numbers, etc.. It may be a while between posts as I have limited time available currently. However, retirement is imminent and should provide me with more opportunity to work on it. 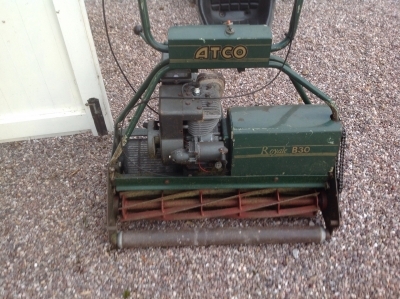 From your comments I think I will not buy a Webb - save the cash for parts for the Atco. This will be my first project of this kind, so I may well be asking for your advice again in due course. Dear all, hopefully I have posted below a few photo's of the Atco together with the parts list suggested by the repairer. Even to my inexperienced eyes it appears that the shaft on the end of the cylinder looks a little untidy to say the least. Wristpin you are correct - it looks like a UNF model (not sure what significance that has for me as a repairer though). As this is my first project of this nature, suggestions as to how to progress, source necessary parts, manuals, etc. would be most gratefully received. Many thanks in anticipation of your continued assistance. Looks like the old thing has had a hard life! The only significance of mentioning BSF / UNF was to make you aware of the changes and that not all parts are interchangeable. UNF parts should be easier to find. 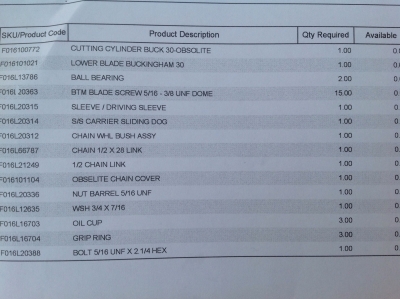 Basically the failure and parts inventory is as I expected plus the addition of a new cutting cylinder. Difficult to tell from the image but it looks as though there may be a bit chewed off the end of the cylinder shaft. A quick check of current "Atco" prices makes that list come to £744.45 + vat (plus one washer that I cant identify!). Now you can probably buy a non genuine cutting cylinder for less than £316.17 and almost certainly a new bottom blade for less than £75.68. Also no need to buy 2 "genuine" bearings at £49.86 each when the same thing from Simply Bearings is probably around a £20, the pair, and you possibly don't need a new chain case cover at £43.86. However for the sprockets and things you are stuck with genuine unless you go the second hand route but that's definitely a case of buyer beware. Hi Wristpin, thanks for the prompt response. I am rather inclined to get the old girl working properly again. The repairer quoted over £1,000 for the repair which was just not justifiable to me. I am happy to spend a few hundred quid on parts. I have the chain cover, so am uncertain why they have recommended a new one. I am unconcerned with the cosmetic appearance. can you indicate where the best source of non-genuine cylinder and lower blade might be? I think used sprockets would be a false economy. An indication of sources of information/guidance/suppliers/manuals would be most appreciated. I am in no hurry - if it's ready for next year that would be fine. This year would be a bonus! With no time pressure I suppose that browsing the " bay" to spend the same or less money on a donor or substitute machine is an option - but not without its dangers. Garfitts are the obvious choice for a new cylinder and bottom blade and they offer a discount to OLC members. There are a couple of other cylinder manufacturers but to the best of my knowledge they are tied to, or only supply machine manufacturers - unless anyone knows otherwise? When you've got the cylinder out it will be easier to assess the damage and possibility of a repair. Parts illustrations are easy and I can post a link to Atco lists of the time but as far as I know there were never any workshop manuals as such. However they are fairly basic machines and pretty straight forward to work on and I'm sure that any specific issues can be sorted on this forum. As suggested by wristpin you do need to dismantle the cylinder before getting too far down the road of estimating (posh speak for guessing) which parts must be replaced. Looking at the photo of the drive end of the cylinder it looks rather like the end of the drive sleeve has been sheared off somehow. If this has happened you should be able to remove the section that keys on to the cylinder shaft to assess for damage to the cylinder. As stated bearings and oil seals can be sourced successfully through bearing suppliers and you can save lots of pennies but just a word of caution from one who has been caught out, some unbranded bearings at the very cheap end of the market can have sufficient slackness built into a new bearing that it makes setting up a cylinder mower practically impossible so these should be avoided. My bearing supplier found it difficult to see what the problem was until I told him what was happening in no uncertain terms. Re the chain guard I thought there was a photo showing two tramlines in the lower edge caused by a slack chain, if so I am sure that if this is the only damaged then a welded patch repair should be possible. 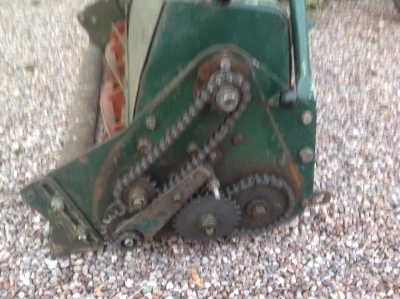 Certainly a mower worth repairing if it can be done at a reasonable cost, but as wristpin points out do consider the option of a donor machine if parts costs and availabilty becomes an issue. If I remember correctly, the sprocket assembly is retained by a bolt that screws into the centre of the cylinder shaft, so the damage may be slight, any chance of a photo with the sprocket etc removed ? If the cylinder can be repaired, it makes it easier to find parts, the same parts were used on the 20, 24 and 30 inch machines. Hortimech's memory is correct , a hex head screw retaining a cupped washer and a spring, all missing from any of the posted images but shown on the Dropbox link in my first post on this thread: and yes, the parts are all common to the three sizes of Royale . M Dear all, further to your helpful responses above, I now have the time to investigate the cylinder drive issues further. I have started to dismantle the machine (as much as I need to) and have made a photographic record of each stage. I am afraid that all the photographs referred to seem to appear at the top of this post and in reverse order as my technical ineptitude leaves me unable to insert text in between them! The first (last!) shot is of the reassembled machine with the cover on. Note the damage to the part of the cover over the cylinder drive assembly. The next one shows the cover removed. Third is the cover removed - the grass in the assembly is from where we ran the machine without the cover in an effort to diagnose the problem. Photo's 4 and 5 (backwards!) show the very close proximity of the chain to the cylinder drive engagement lever. The bolt that the lever pivots on is already adjusted out as far as it will go. Number 6 shows the cylinder drive engagement 'dogs' that appear to be in good condition. When running the machine with no cover the 'dogs' could be seen to be operating effectively, but the cutting cylinder would turn only occasionally, indicating that the source of the problem lies elsewhere. The next photo shows the removal of the cup washer and spring. It also shows the damage to the end of the drive sleeve. The next 2 photo's show the removal of the cylinder engagement 'dog' and chains and drive assembly. Photo 10 (back - sorry!) shows the wear/damage to the end of the drive sleeve. As will be seen later the inside of the sleeve is also damaged, as is the end of the drive shaft itself. Next shows the removal of the cylinder drive engagement lever. Photo 12 shows the removal of the drive sleeve and associated cogs. 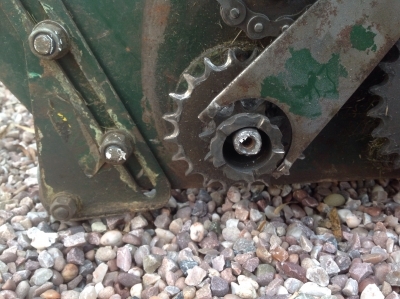 (Please note the wear to the bottom 2 of the 3 bolts holding the cylinder bearing in - see later photo's too). Encountered some technical issues so have continued on this new post! This shows the damage to the drive shaft - almost worn round. Is this supposed to be square or hex? The drive sleeve is similarly worn on the inside. Photo's 14 to 20 show subsequent stages of disassembly. On photo's 21 and 22 please see the wear to the heads of the bottom 2 of the 3 bolt heads holding the cylinder drive shaft bearing. I do not understand what has caused this wear as there appears to be clearance between the bolt heads and the cylinder drive cogs, as indicated on photo's 23 and 24. I am uncertain what to do next and would welcome advice as to the best next step. If this involves removing the cutting cylinder (as I suspect) how much of the machine must I dismantle to free it? Thank you in anticipation of you assistance and apologies for the length of the post(s!). The end of the cutting cylinder shaft should be splined and the inside of the sleeve likewise to match. - four splines. Its possible that a skilled turner or engineer could make the necessary repair but probably the best option is good used parts . New parts are still available but at a price. The damage is the result of wear and tear going uncorrected and prolonged running with loose components flopping about. Maybe instigated by over tight chains. The cylinder drops out easily; remove three hex head screws at each end and lift out. Many thanks for your helpful reply Wristpin. I have now removed the cylinder. I have a relative who is a skilled engineer and I will see if he can machine the drive shaft and sleeve satisfactorily. If not, it looks like at least one new part. The sleeve looks to be priced at around £60. It looks as if the end of the drive sleeve has been damaged by either a collision and/or friction against the cover, as the cover has worn clean through necessitating a bit of fabrication. A problem that I am struggling to see a solution to is the proximity of the cylinder drive actuating lever to one of the chains. Hopefully the image above illustrates the issue. Any ideas? I will post again when I have an opinion on the engineering work. In the meantime, thank you for your continued assistance. That rocking lever is pivoted on a stud in the chassis side plate and held in position by a spring and a small spacer - any chance that the spacer (77) is missing or that there is some incorrect assembly or adjustment in the actuating rod (88) or spring (101). Another possibility is that the rocking lever is trapped between the shoulder on the stud and the lock nut. When assembling it is necessary to push the lever onto the stud compressing the spring and spacer so that the shoulder is exposed and the nut screwed right up to it , thus eliminating the possibility of the lever being trapped between the nut and shoulder. However all that assumes that the cylinder extension, sleeve and dogs are correctly located and assembled. Well - after almost 18 minutes months(!) I finally have the cutting mechanism working reliably on the old girl. Many thanks to all who helped by providing valuable information. Imagine my frustration when, first time out and halfway through the lawn, the transmission appears to have packed up. When releasing the clutch the main 'drive roller' simply does not turn. Can anyone let me have a parts diagram so that I am not going in blind please? When releasing the clutch the engine pitch reduces and it feels like something is trying to engage, but no forward movement - hence I am suspecting no cable issues. I can pull the mower backwards and the roller will turn freely in that direction. Thank you for n anticipation. Just make sure that the loading on the engine is not being caused by a jammed or tight cutting cylinder overloading the multi plate main clutch, so disengage the cutter clutch and try again. Meanwhile I'll dig out a parts illustration for the rear roller, but stripping that is not a five minute job. EDIT. Here are the relevant parts illustrations. Wristpin - I am forever in your debt! It transpires that I had simply choked the blades with grass by setting the blade too low. Clearing it out and raising the blade has resolved my problem.